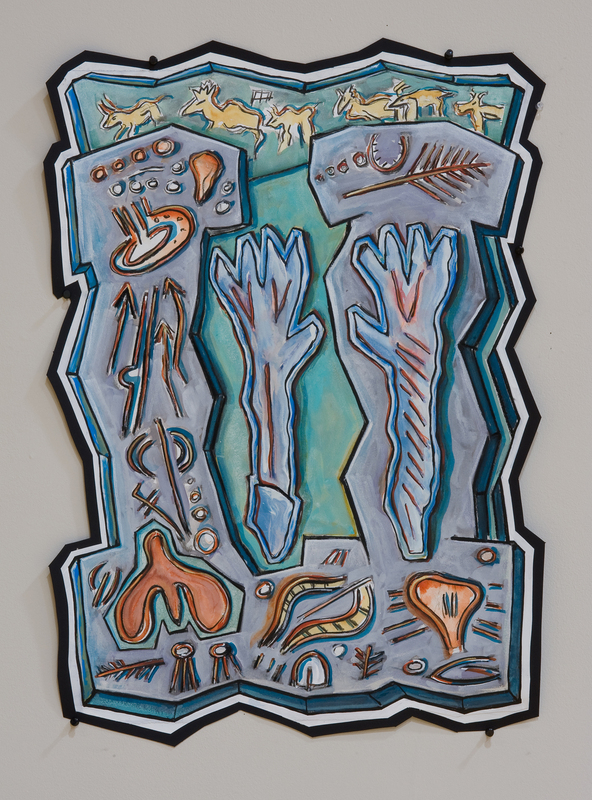 "The Archives of the Museum of Pre-History" consists of all works on paper , prints and drawings, and is the core of research for ancient signs and symbols that become the "artifacts" or "restorations" of ancient objects that make up the collection of the"Museum of Pre-History". 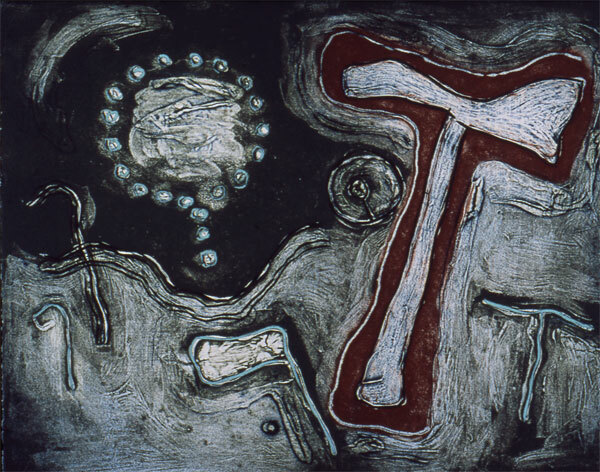 1"Entablatures of the Sun and Moon"
The nine "Entablatures of the Sun" on the left are balanced with the nine "Entablatures of the Moon"on the right. 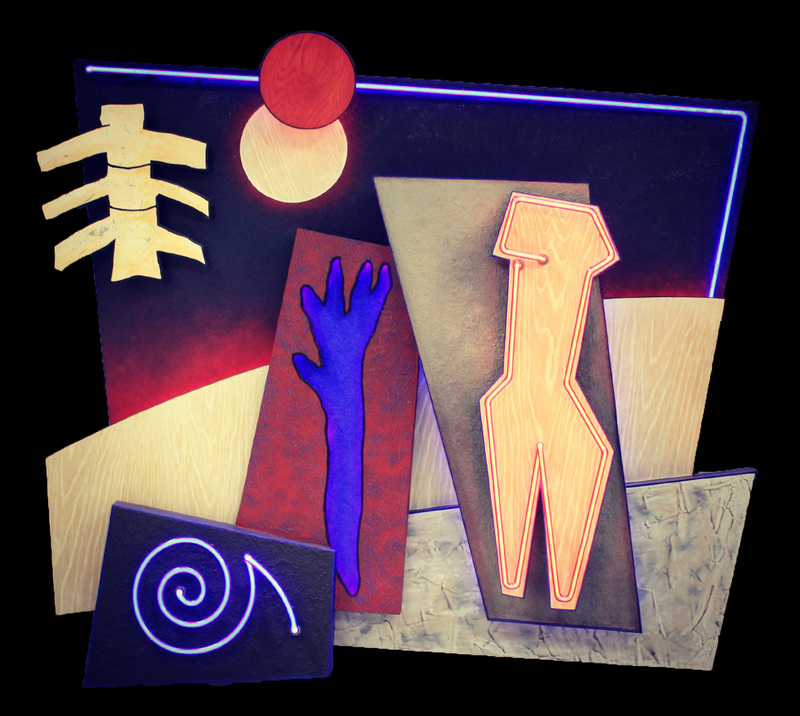 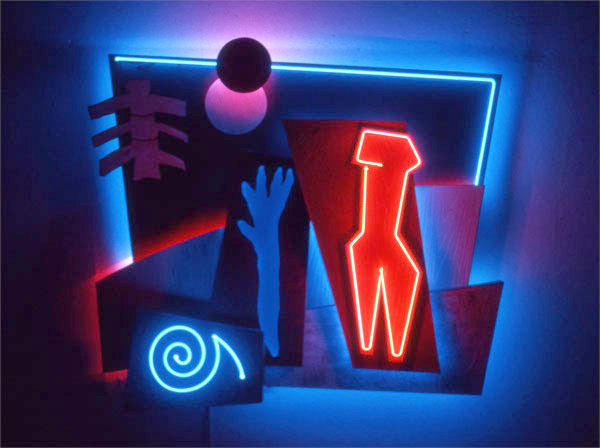 The three neon "Stones of the Sun and Moon" are the core for bringing together these astrological male and female symbols. 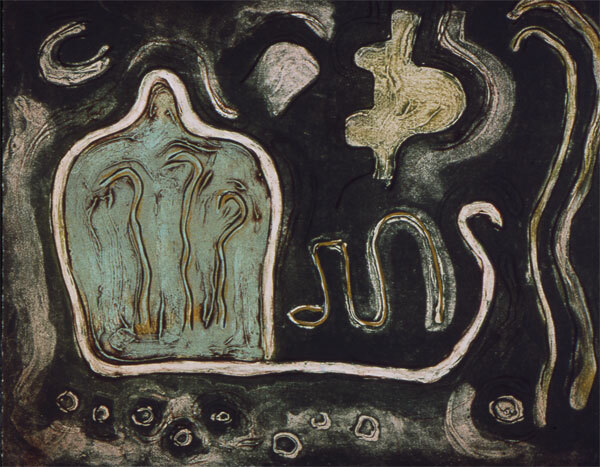 The "Entablatures" represent the third age of man known as "Bronze Age Beauty" in the Museum. 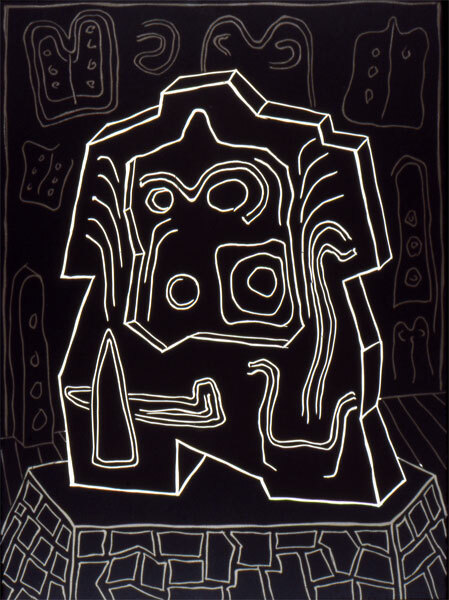 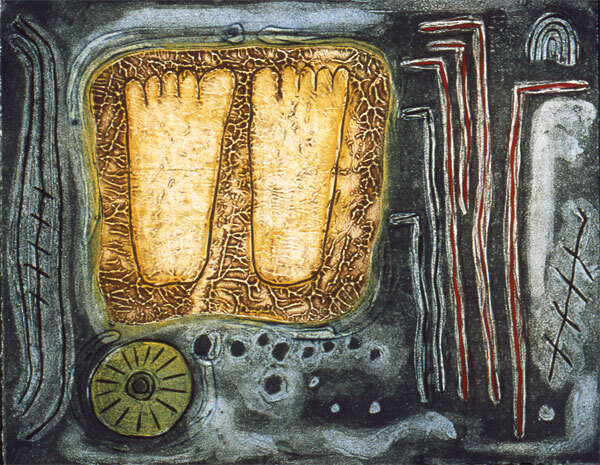 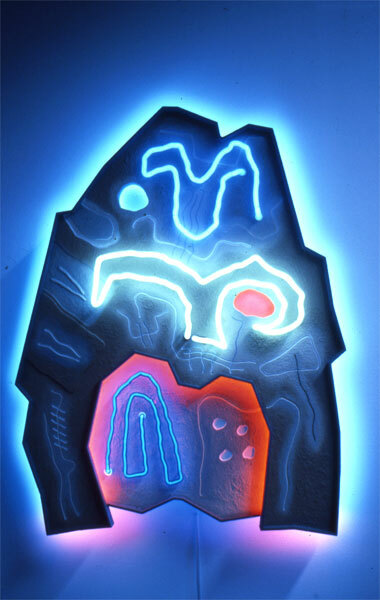 “CAVE RAVE” is the central artifact of “The Caveman’s Dictionary”, only a small portion of a large body of work that the artist entitles “The Museum of Pre-History”. 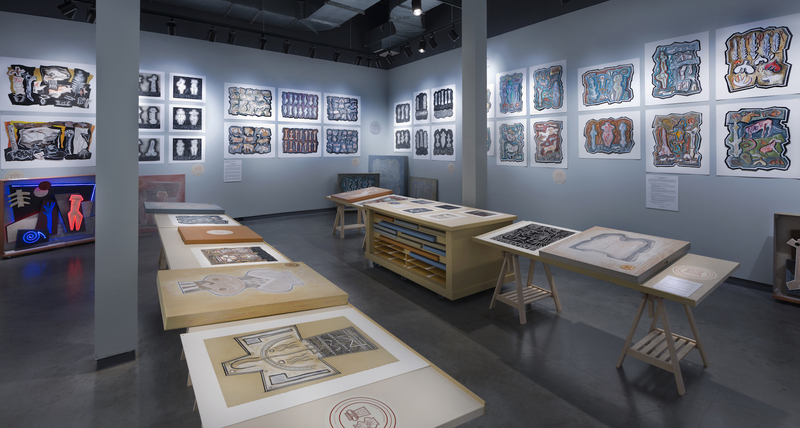 The Museum explores the psychological development of human kind through “Archives” and “Artifacts” drawn and built from experience of site explorations in Europe and research by the artist. 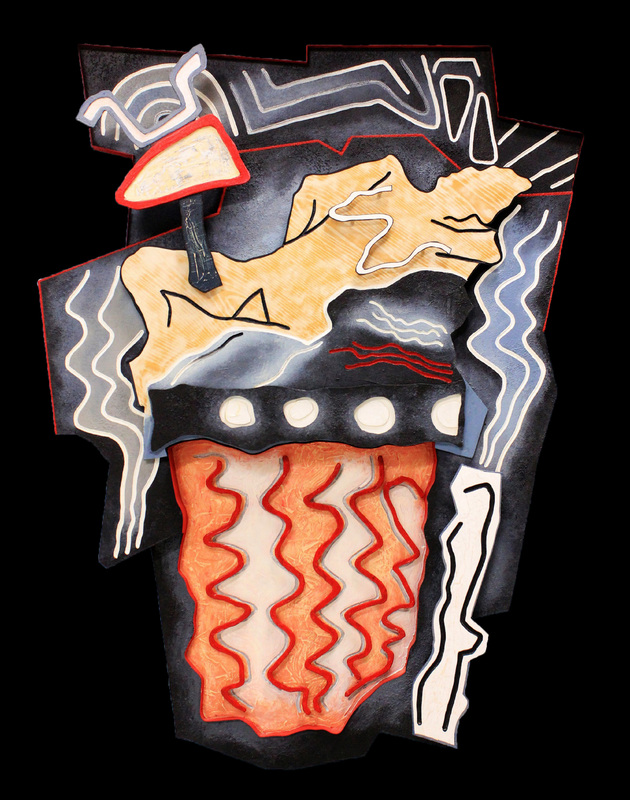 The artist visited 8 Paleo-lithic cave sites in France and Spain for inspiration for developing “The Caveman’s Dictionary”. 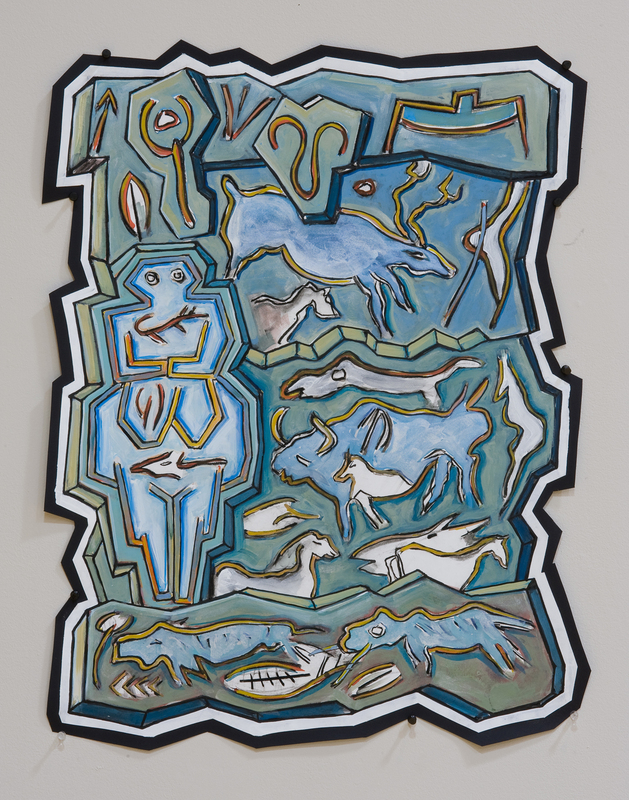 During its installation, “Cave Rave” becomes a “performing painting/installation” that is an imaginary archeological puzzle of a paleo-lithic cave painting. 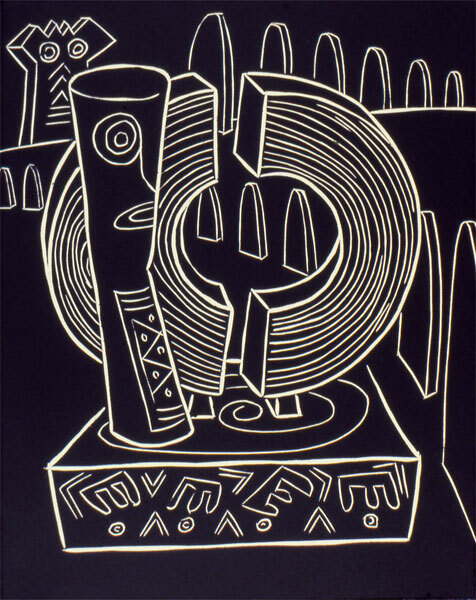 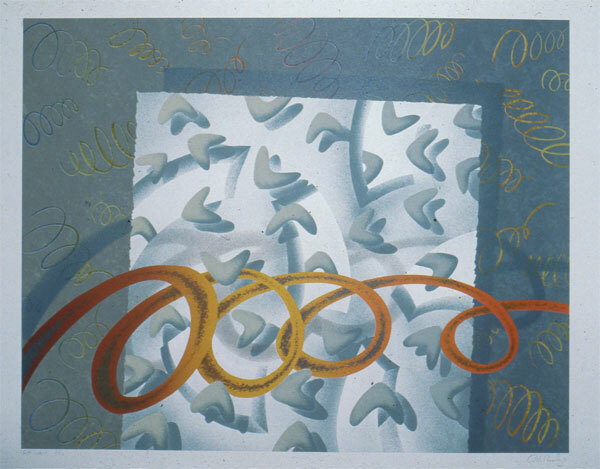 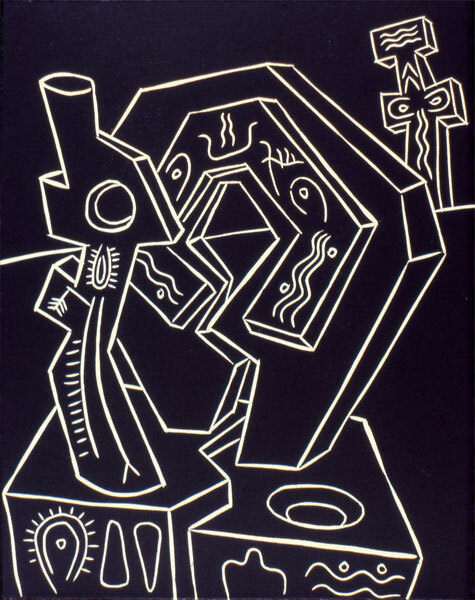 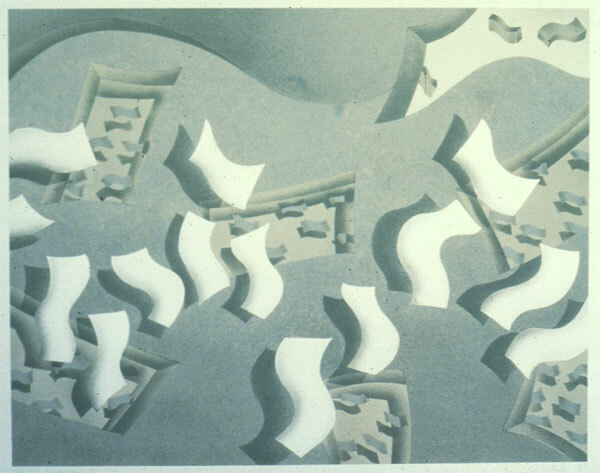 The painting is changed by the artist during exhibition to explore meaning and the balance between language and abstraction vs. perception and intent. 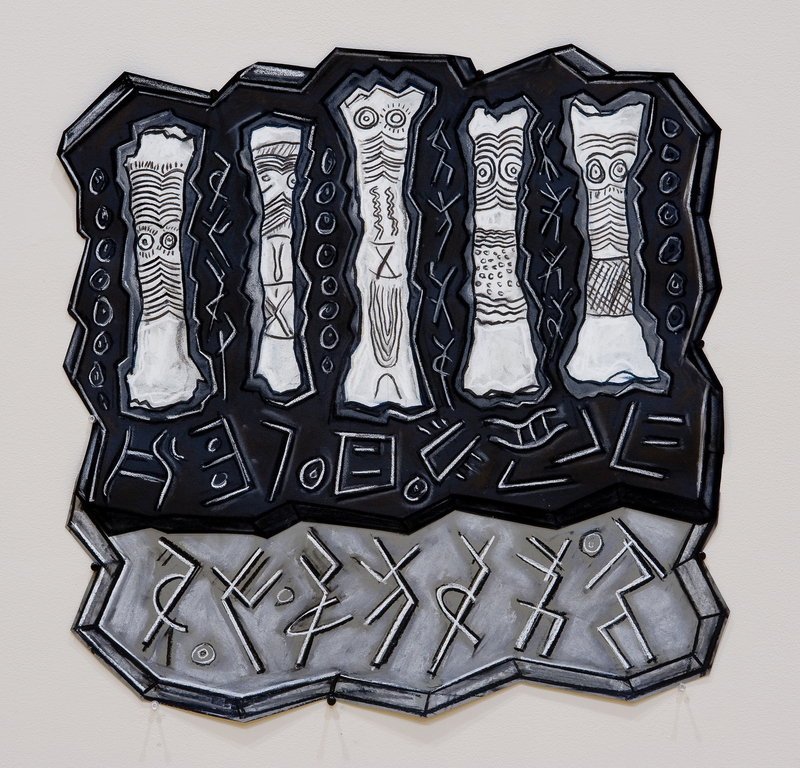 The artist explores the use of archeology in puzzling together insights into who and what we are. 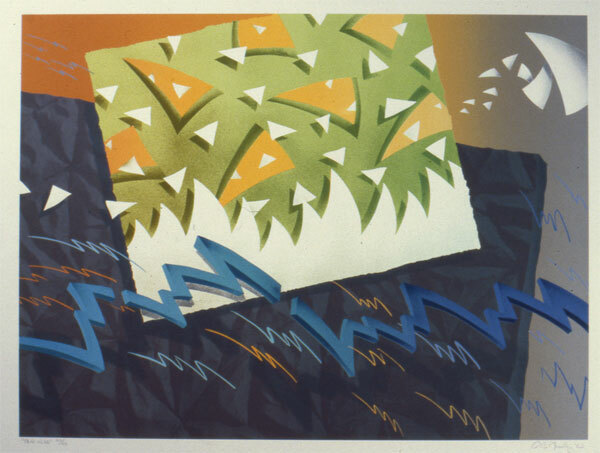 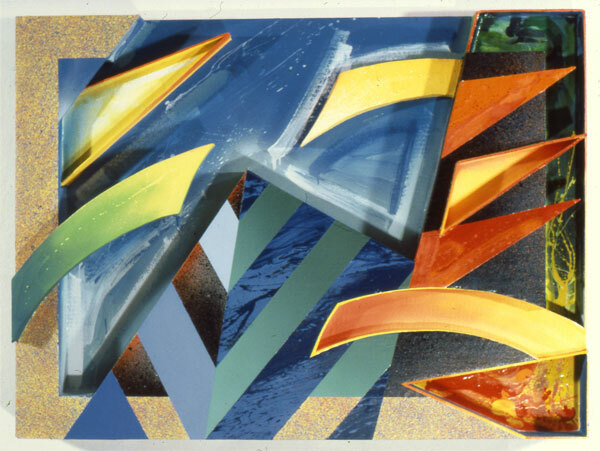 During the exhibition, the artist continually changes versions of the two- layered painting. 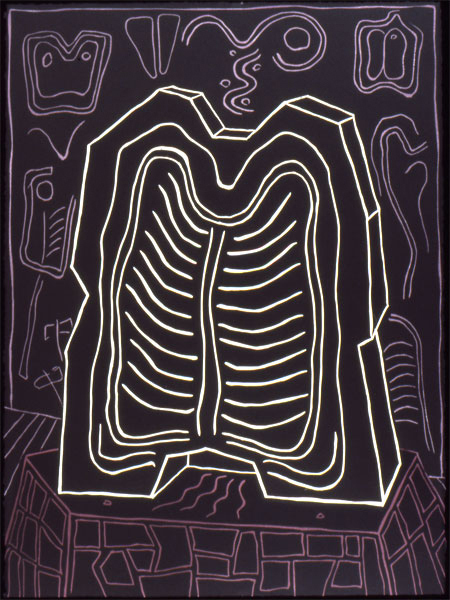 A culminating performance (20 minutes), entitled “The Incantation of The Caveman’s Manifesto” is used to bring together the puzzle and explain the meaning of “Cave Rave” and the magic of “The Caveman’s Dictionary”. 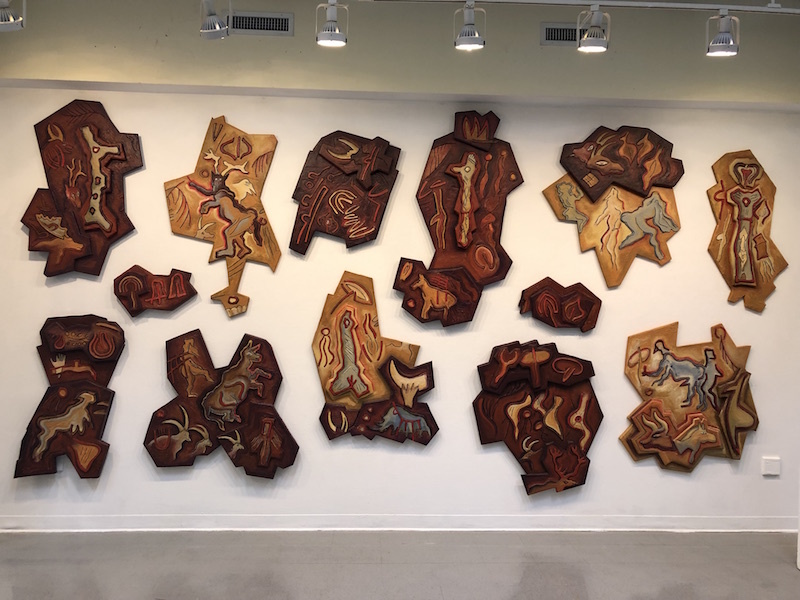 The painting is physically changed from abstraction to representation during the performance, as the artist reveals the meaning of each of the 13 puzzle pieces as well as revealing a piece of who and what we are as creatures on earth. 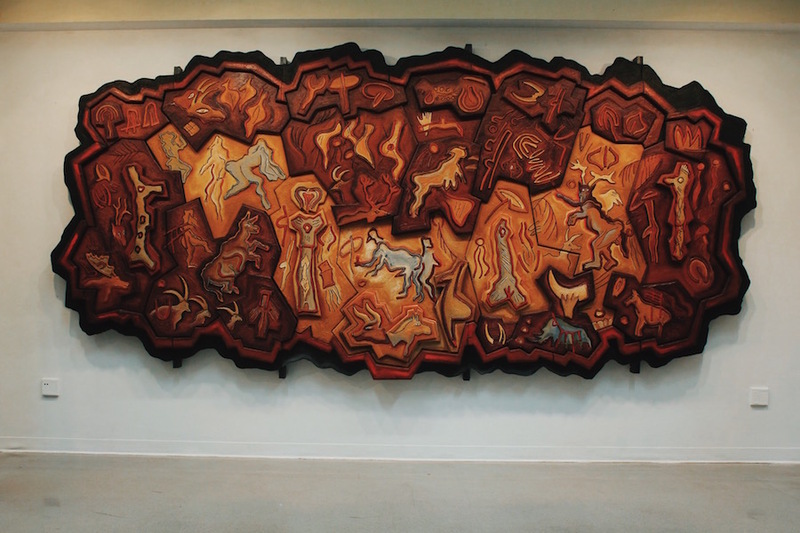 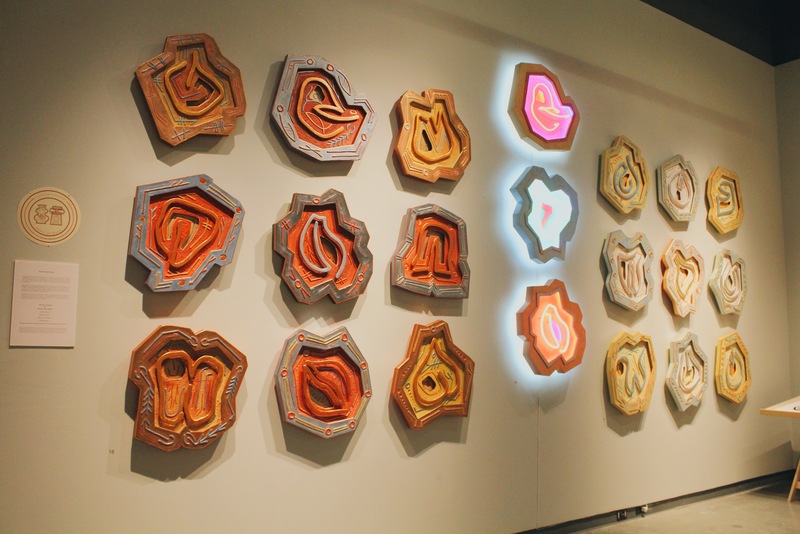 The two layers of “Cave Rave” (8’x 16’ overall) are built from a substructure of wood, with sculpted insulation-foam layers, painted with water base paints and glazes. 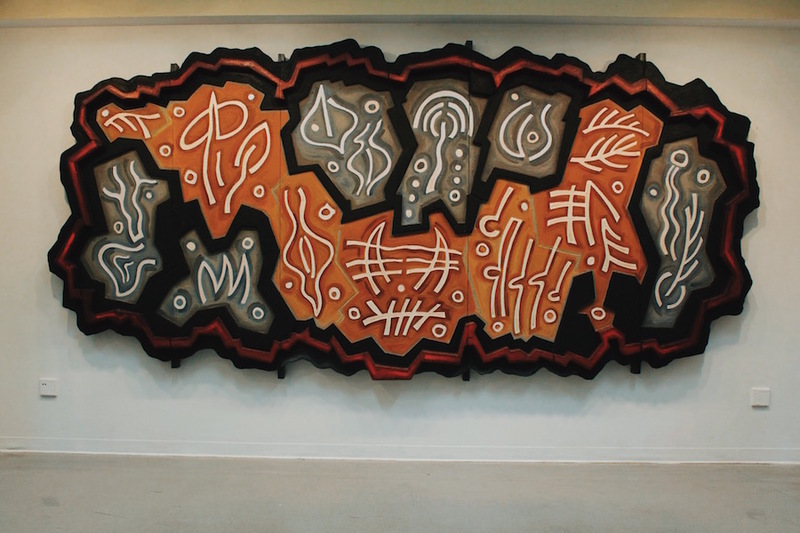 A quick time lapse video of the installation of "The Museum of Pre-History" at the Creative Alliance, Baltimore, Maryland, August 2013. 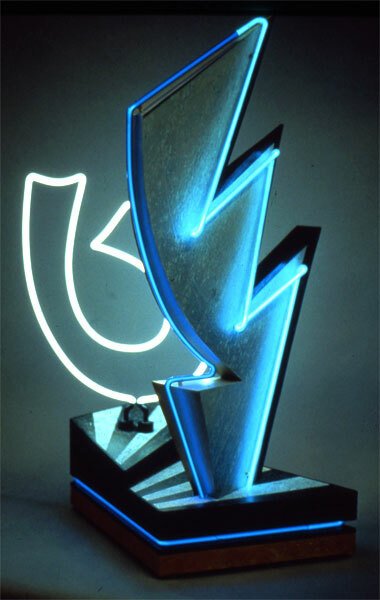 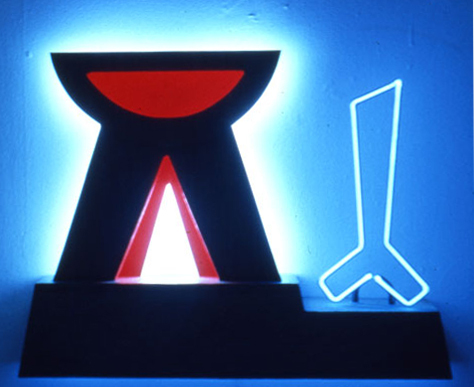 The Museum contains many artifacts restored by artist Quentin Moseley for the three major collections of the museum: "The Caveman's Dictionary", "Neolithic Neon", and "Bronze Age Beauty". 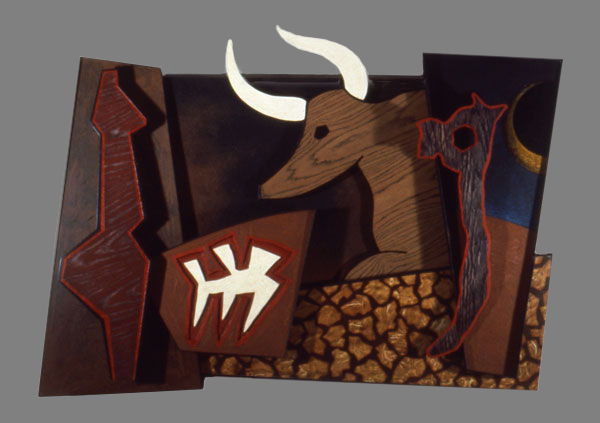 Each of these artifact/restorations comprising "Caveman Constructions" comes from one of several bodies of work (excavations or digs) comprising the paleolithic collection of The Museum of Pre-History known as "The Caveman's Dictionary". 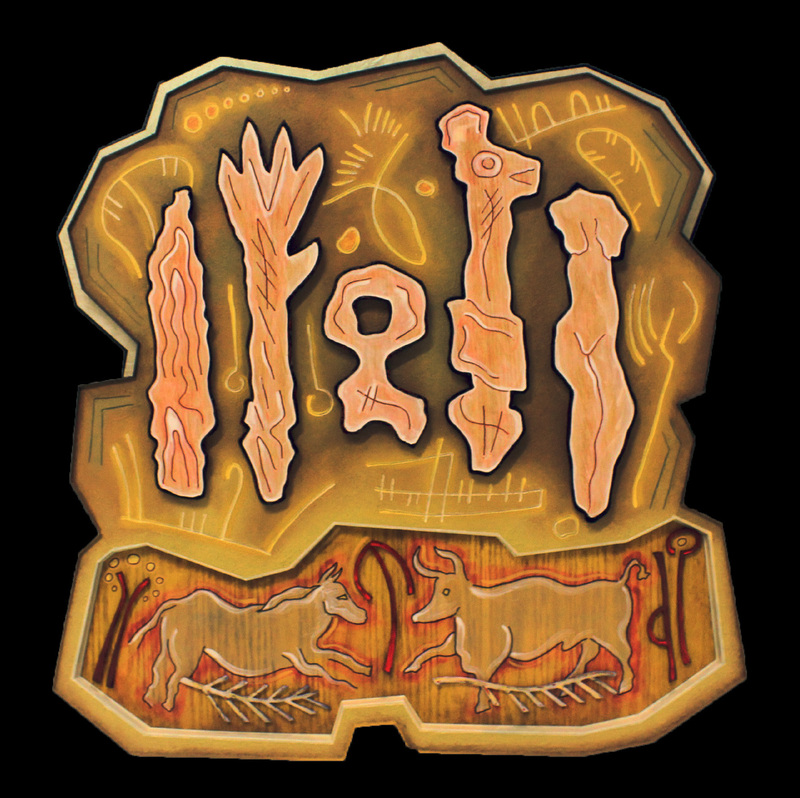 "The Caveman's Dictionary" consists of: Caveman Story Stones, Caveman Codex Stones, The Power of Three Stones, Paleo- Couples, and others. 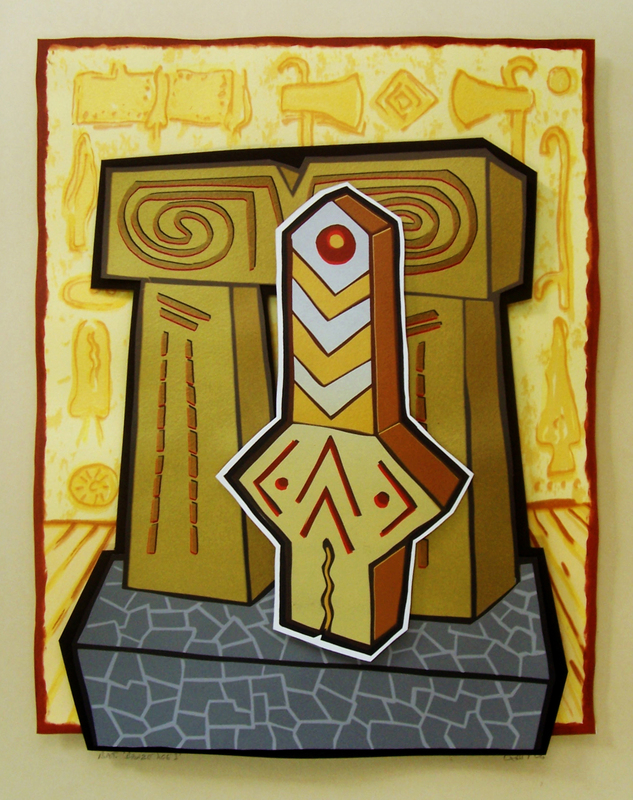 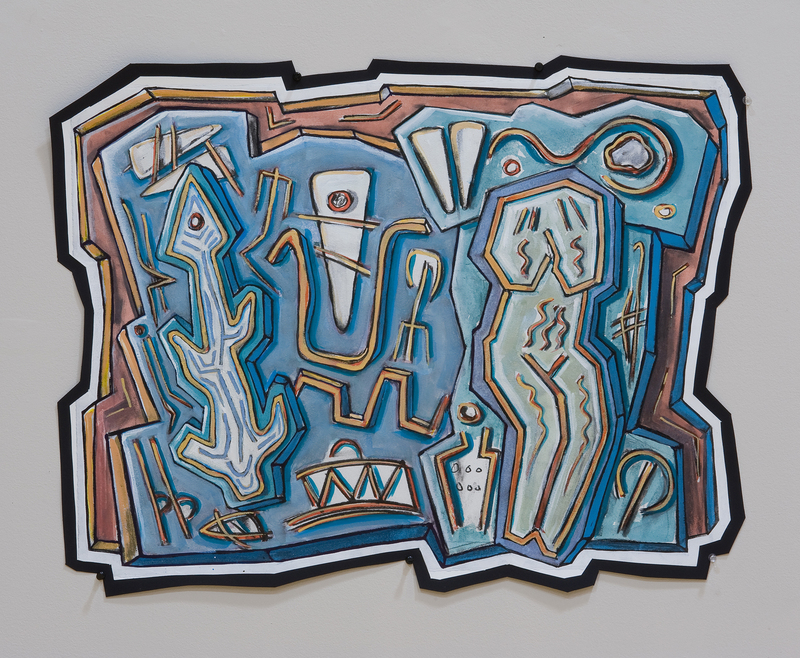 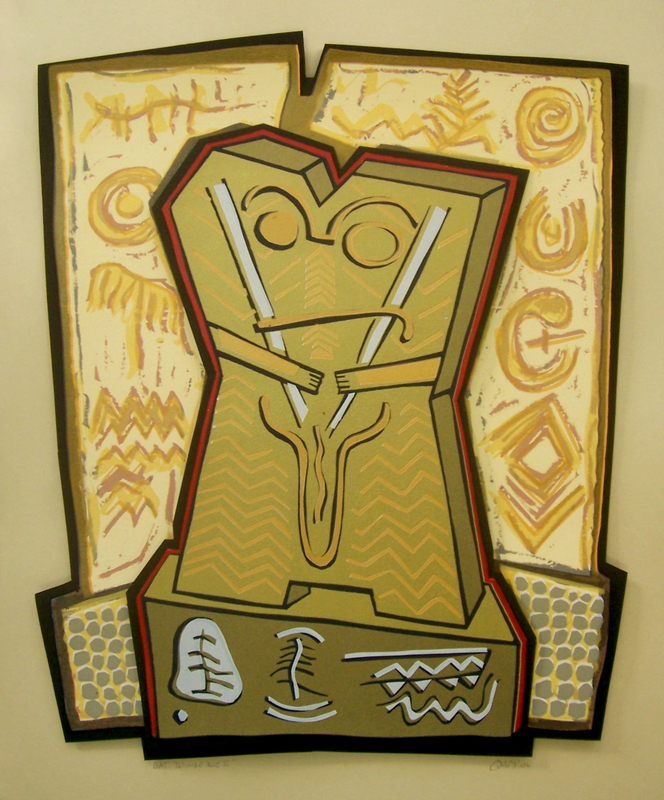 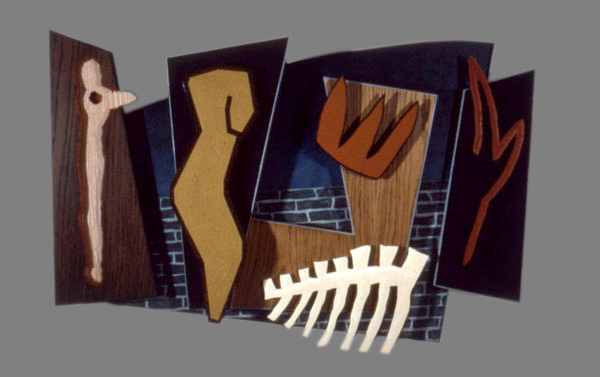 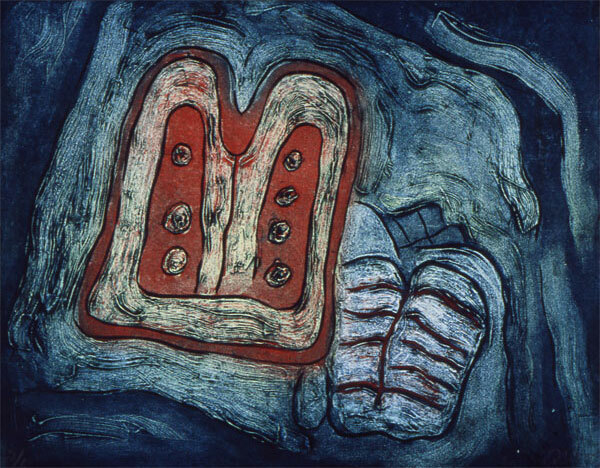 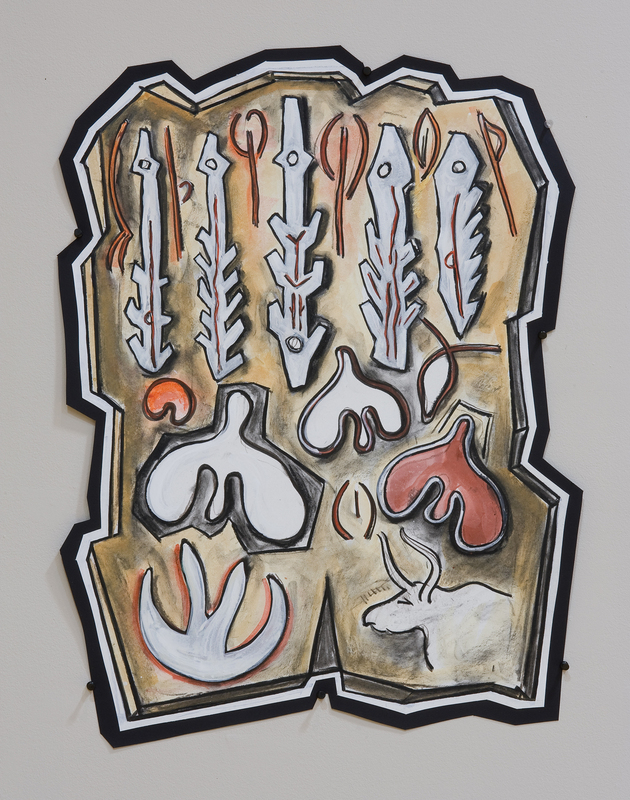 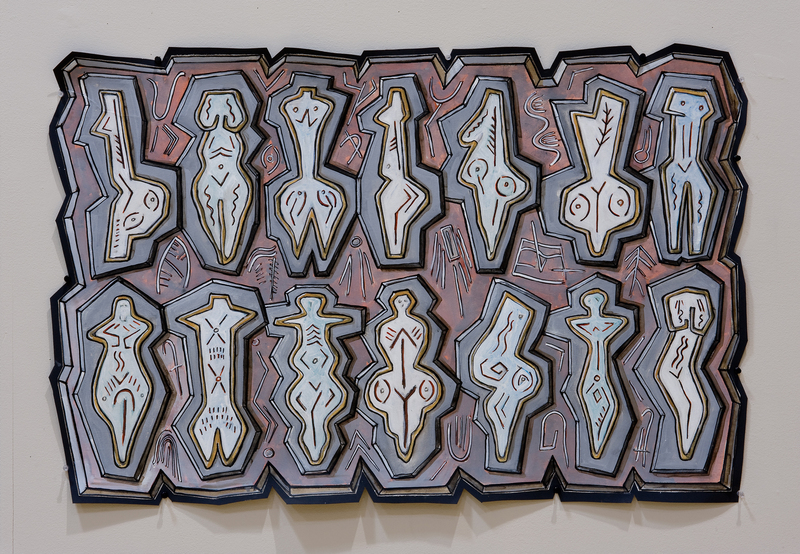 acrylic and veneer on wood construction 1994 49"x32"x8"
(two birds, two hermaphrodites, and a death stick) from "Caveman Codex Stones" acrylic on wood construction artifact: 35x43x5 crate: 43x48x10"
from "Caveman Codex Stones" Acrylic on wood construction Artifact: 38"x38"x5" Storage Crate: 51"x48"x10"
(Reclining Woman with man, horse, smirking auroche, and tool for The Bringing Together) from series "Caveman Story Stones" acrylic on wood construction 2010 artifact: 53"x38"x5" storage crate: 63"x48"x10"
Each of the "Caveman Drawings" supports research for the restorations of the "Caveman Constructions" and are called collectively "The Caveman's Dictionary". 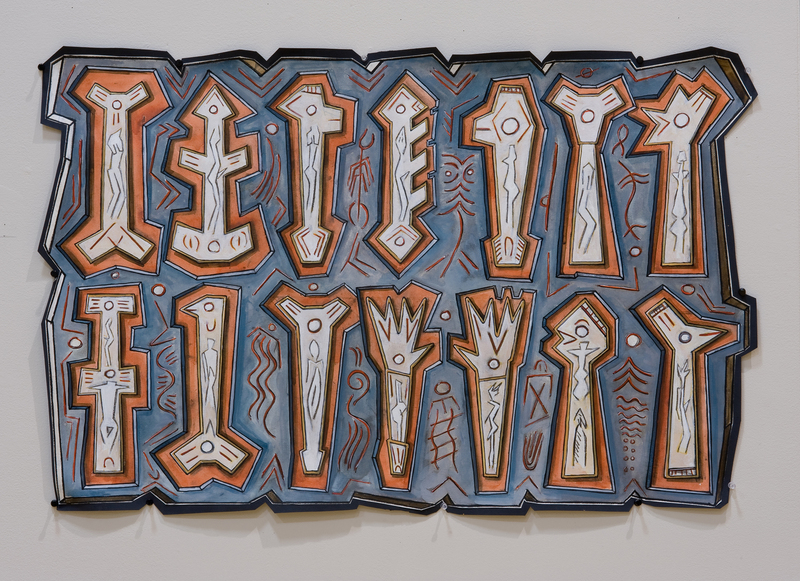 Dig #3: Title Stones for "The Caveman's Dictionary"
Each of the drawing series has three to nine variations to elaborate the subjects of the Museum's excavations or digs. 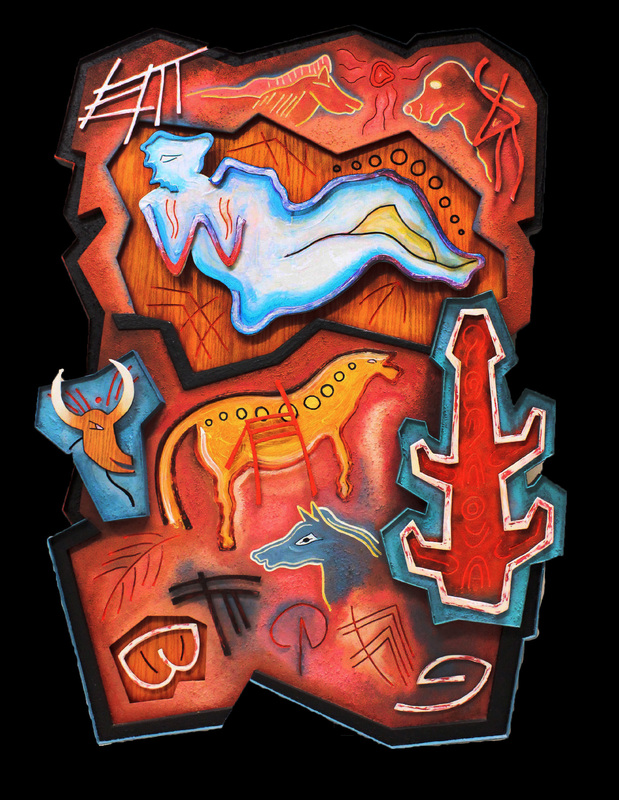 These artifact restorations are based on visits to the ancient menhirs and dolmens of Brittany, some of the oldest megalithic sites in Europe dating from 4500 BC. 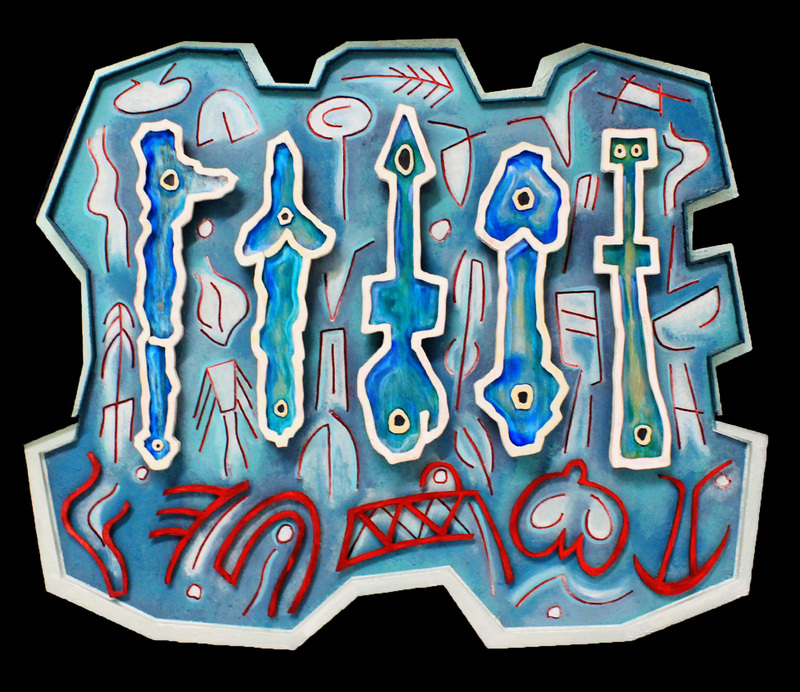 Many of these sites surround the Gulf of Morbihan, where the amazing site of Gavrinis resides on an island in the middle of the Gulf. 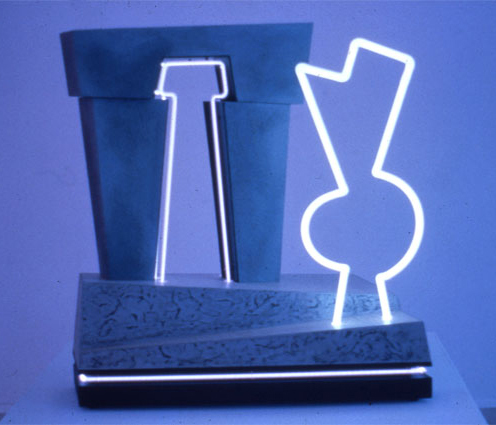 on a base platform or plinth. 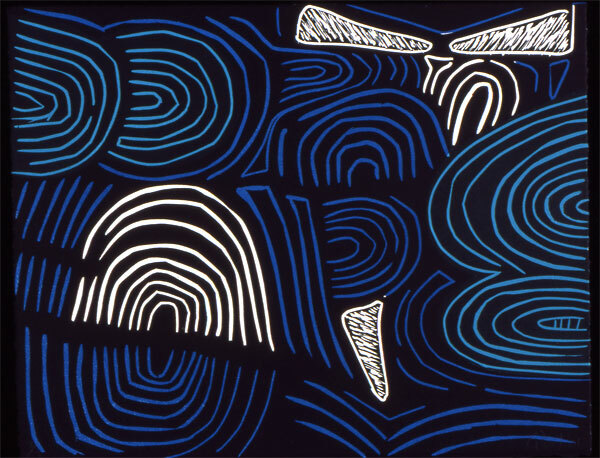 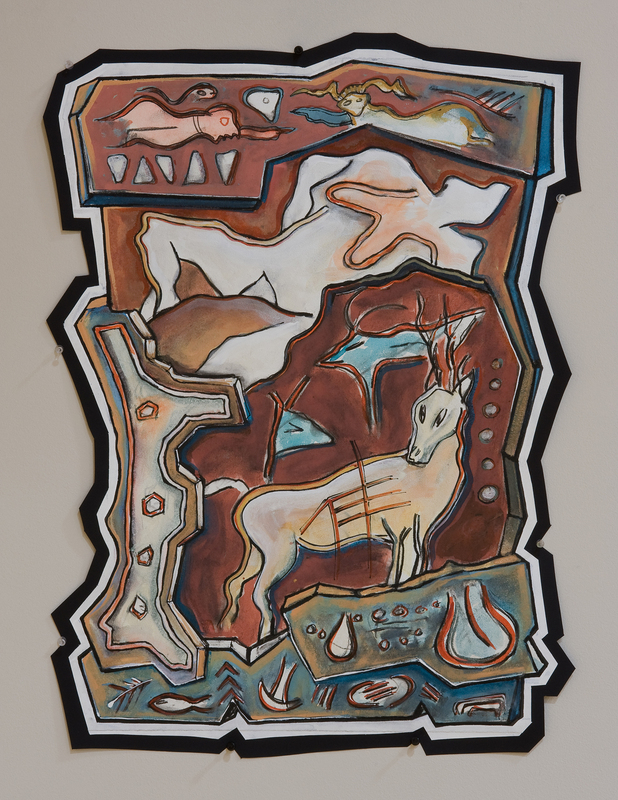 acrylic, veneer on wood construction approx 24"x 34" x 6"
Several series of Neolithic Prints have supported the research for Neolithic Neon. 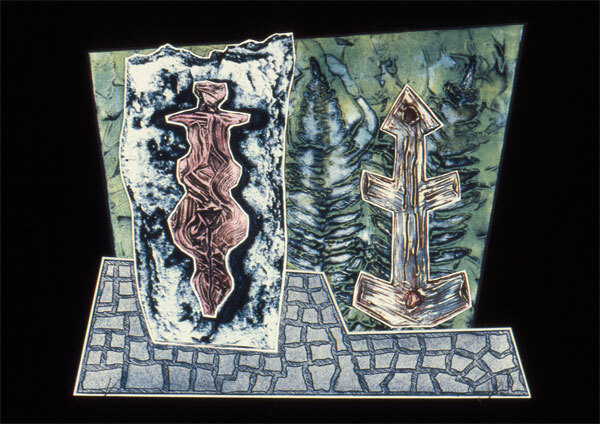 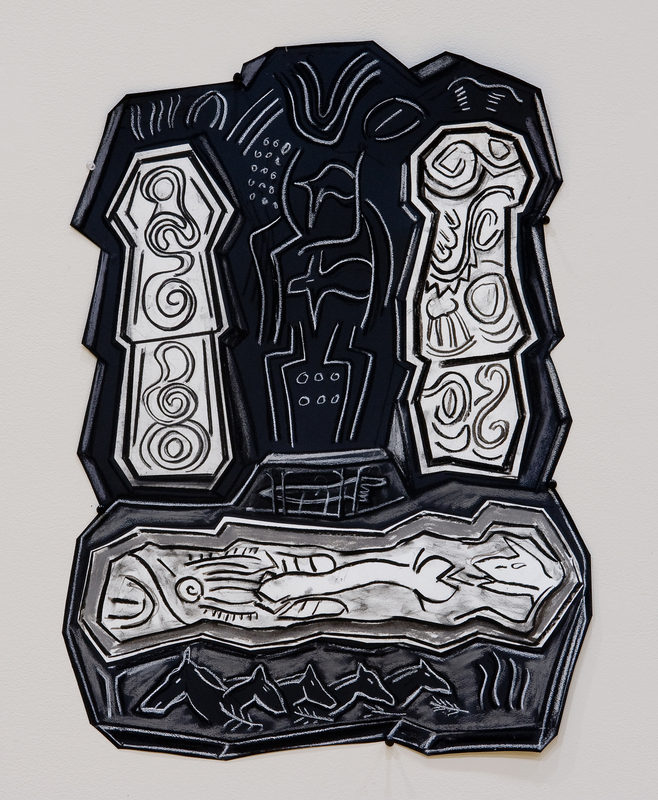 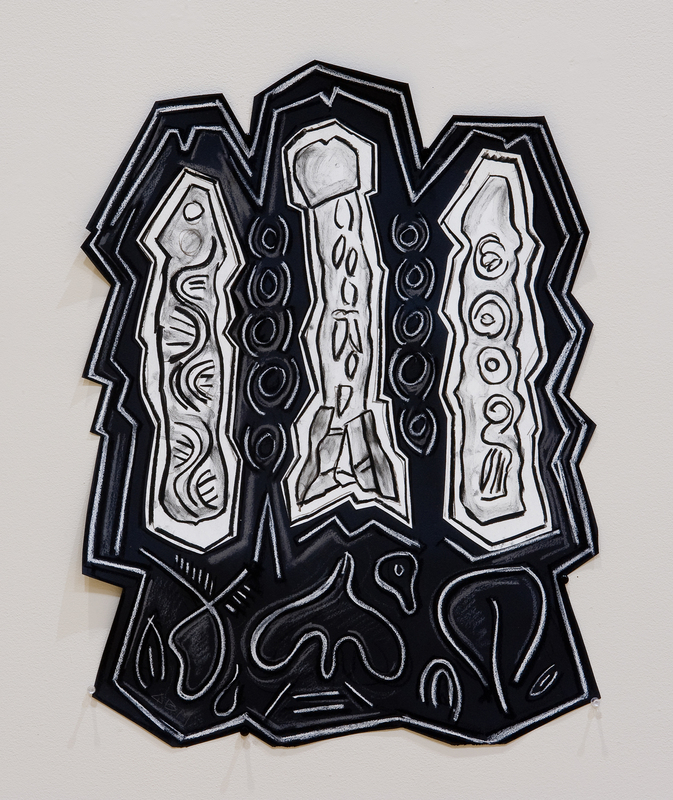 Relief Prints: "The Stones of Morbihan", "The Stones of Gavrinis, "The Monument of Morbihan"
Collagraph Prints: "The Menhirs of Morbihan"
"Gateway Baltimore", a slow moving animated neon mural installation was commissioned by and developed for Light City Baltimore, 2016......the first international light art festival of the city. 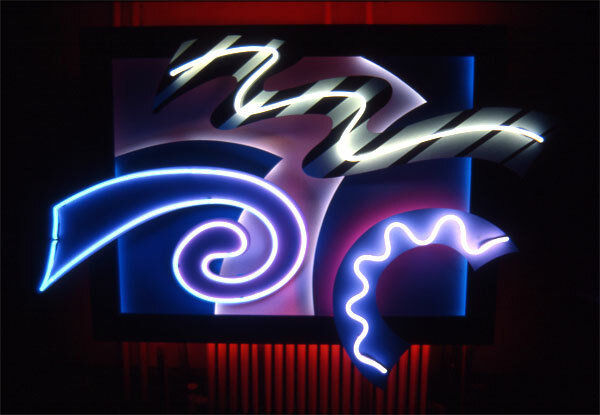 This piece was created out of a modular system of 6' sticks and 4' circles of neon to bring together a frieze of neon that speaks of change and unity and bringing together......a metaphor for Baltimore itself as it searches for new definitions of working for a united front in dealing with the challenges we confront together. 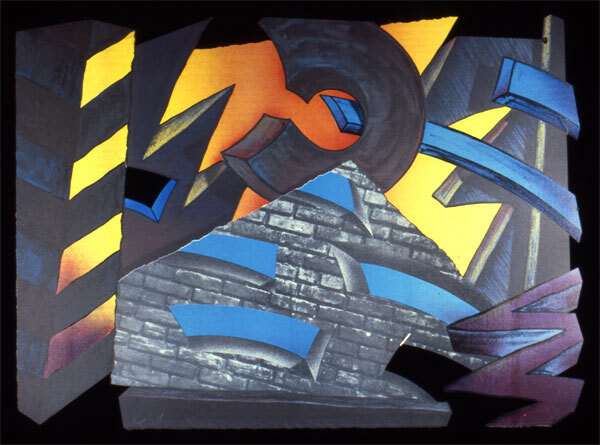 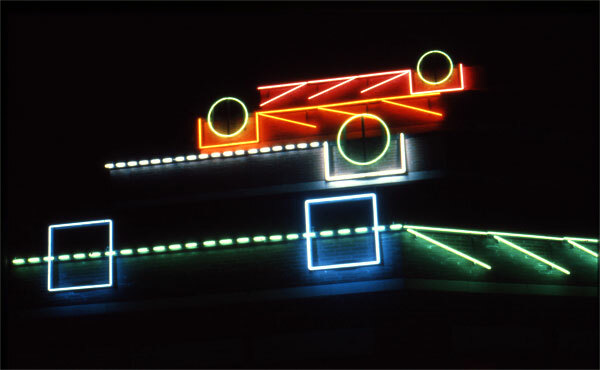 The structure and neon components of this mural can be re-arranged into any configuration the artist chooses for re-installation, preferably on the parapets of high rooftops of buildings that can be viewed from great distance, inviting one to the location for close-up viewing. 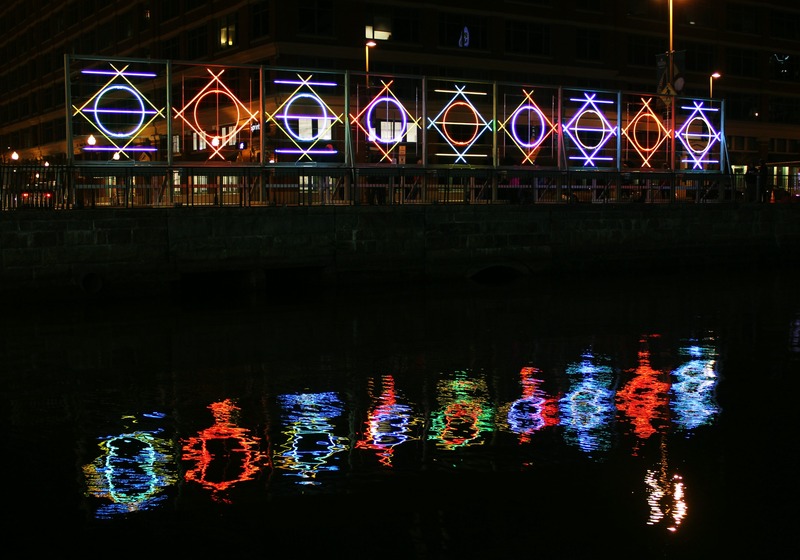 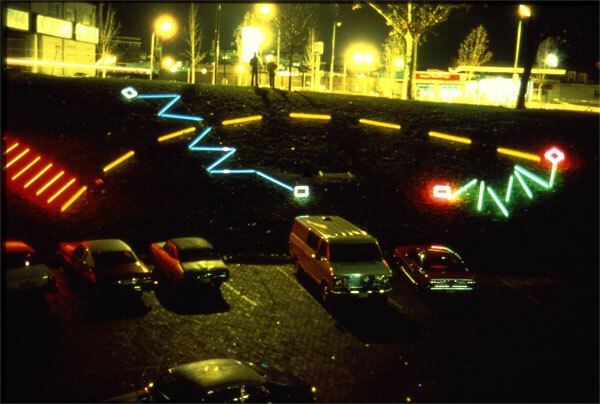 Compare this installation to other animated neon projects/murals in the "Night Drawing" section.....many installeded in Baltimore, as well as other cities. 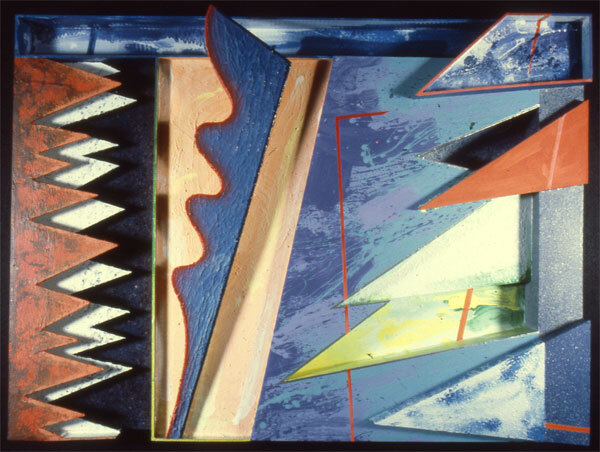 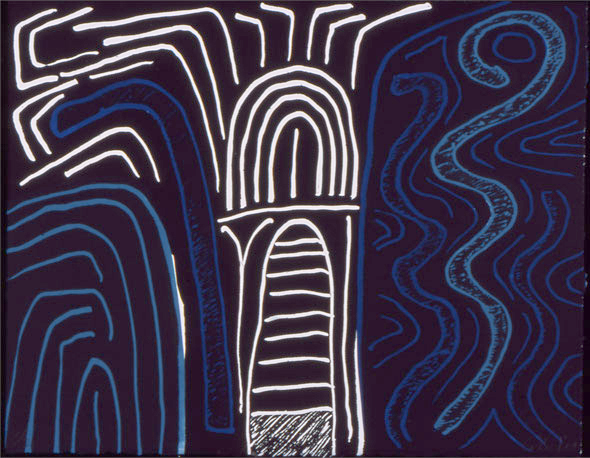 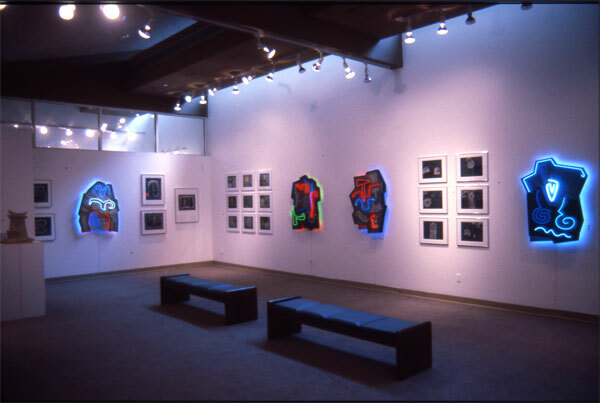 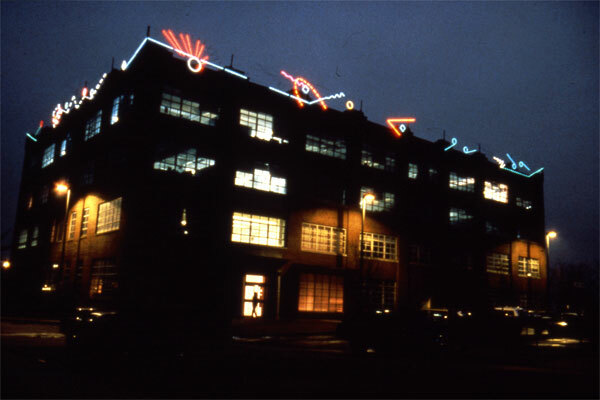 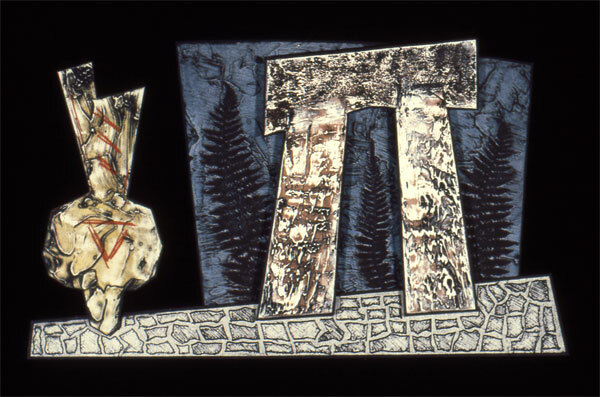 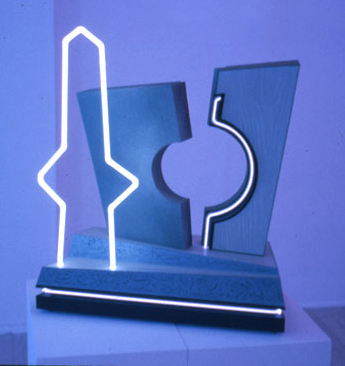 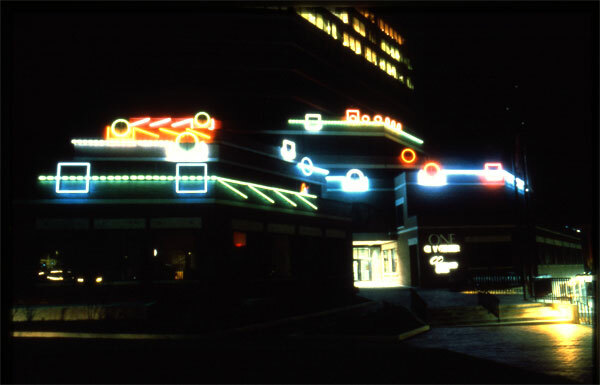 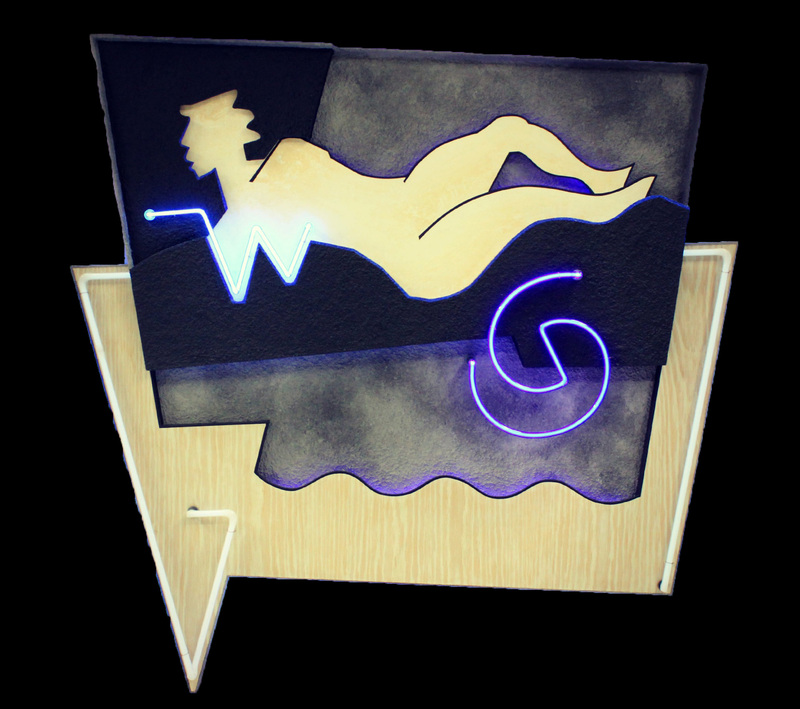 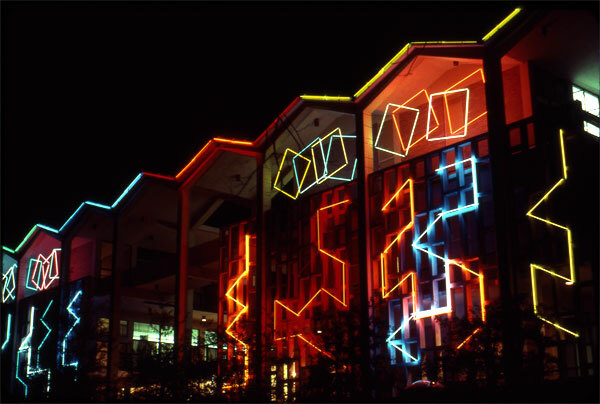 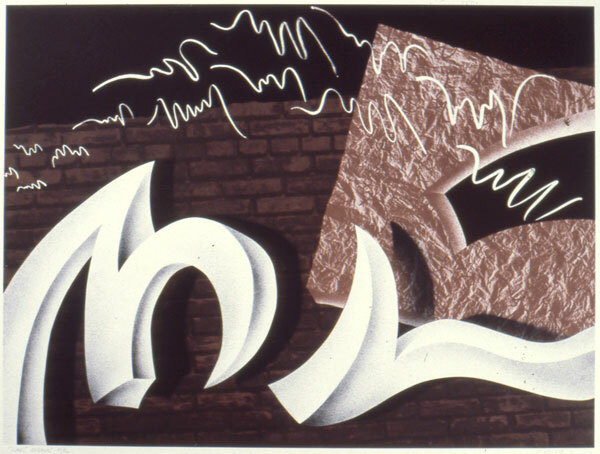 During the 1980s these large scale, outdoor public art pieces were temporarily installed under the name of "Night Drawing". 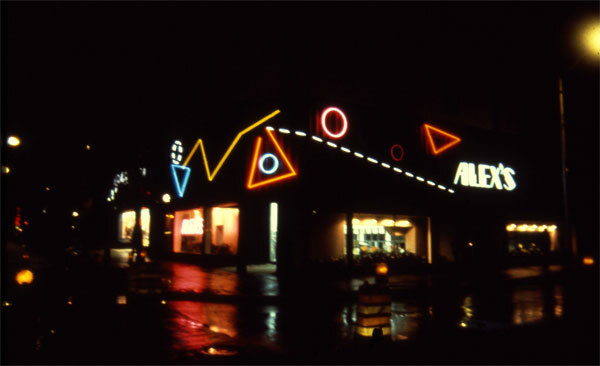 They started as an undergraduate design project at Syracuse (1969) with a modular system of 6' sticks of yellow neon and some 24" red squares. 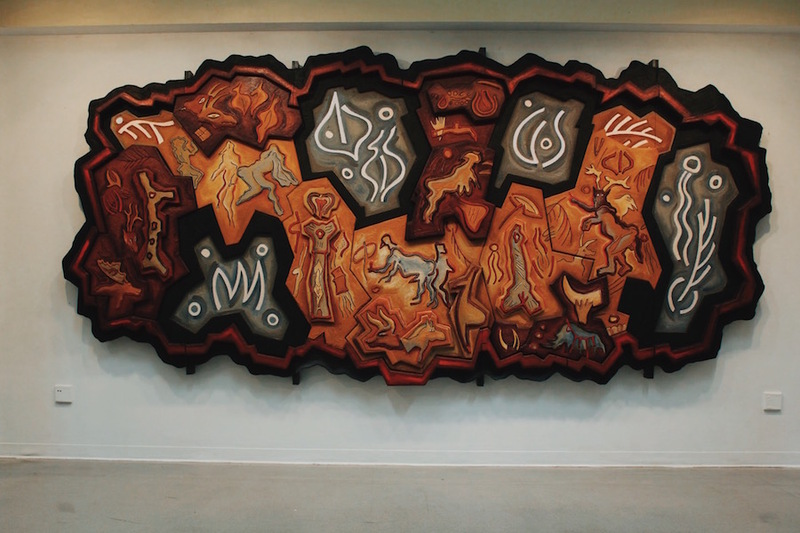 The largest piece to date was two 8'x100' animated murals in multi colors on either side of the 26th story of a building in Miami. 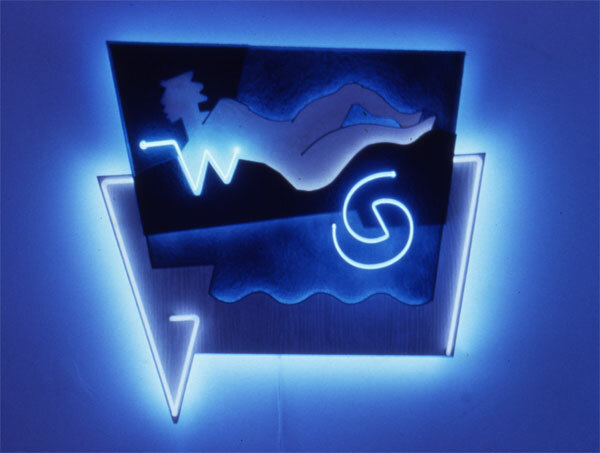 Night Drawings were temporarily installed in Philadelphia, Portland Maine, Memphis Tennessee, Miami Florida and many in Baltimore, MD. 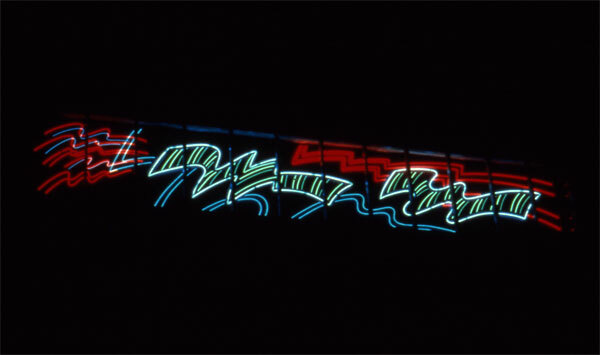 Still shot (time detail) of "Gateway Baltimore", modular neon animated mural at Pier 4, Pratt Street, Baltimore for Light City Baltimore, 2016. 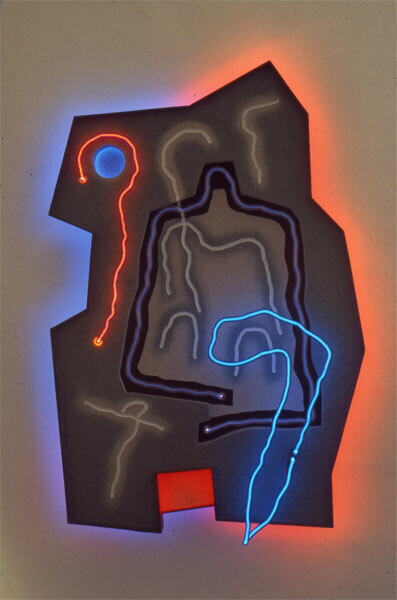 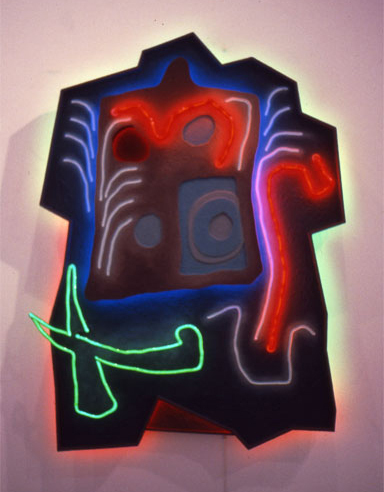 These constructions and prints relate to the shapes and action of the large scale animated neon "Night Drawings" of the same time period. 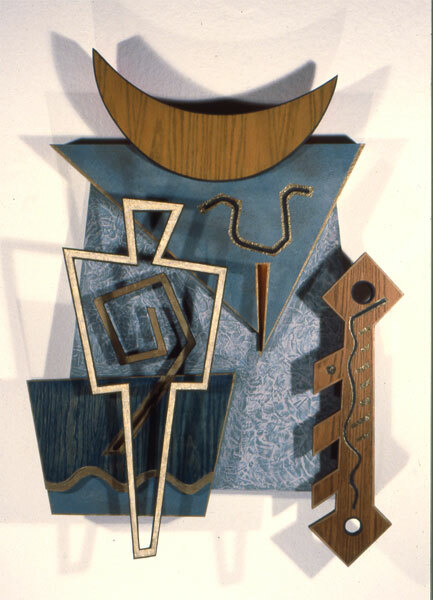 The smaller scale allowed the exploration of a number of different references for the forms that were of interest at the time. 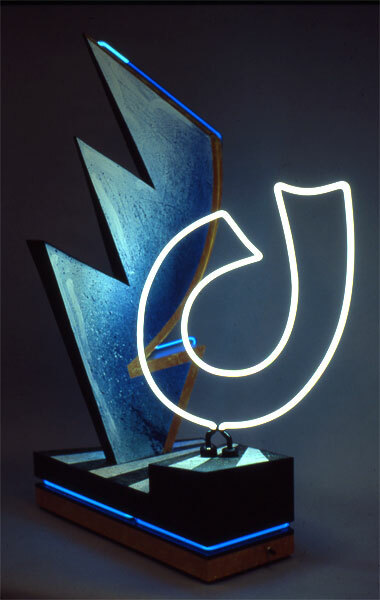 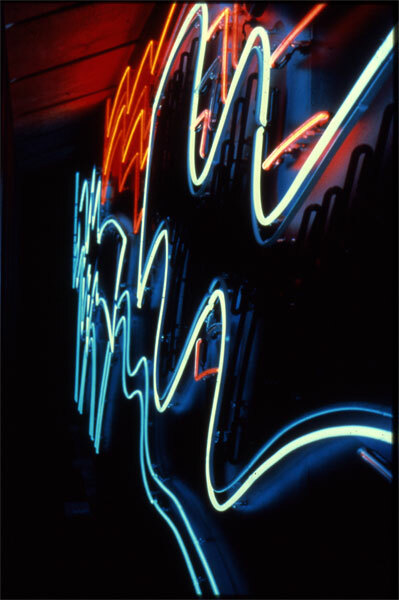 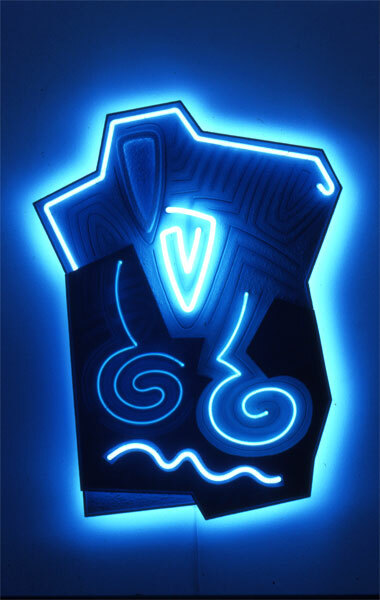 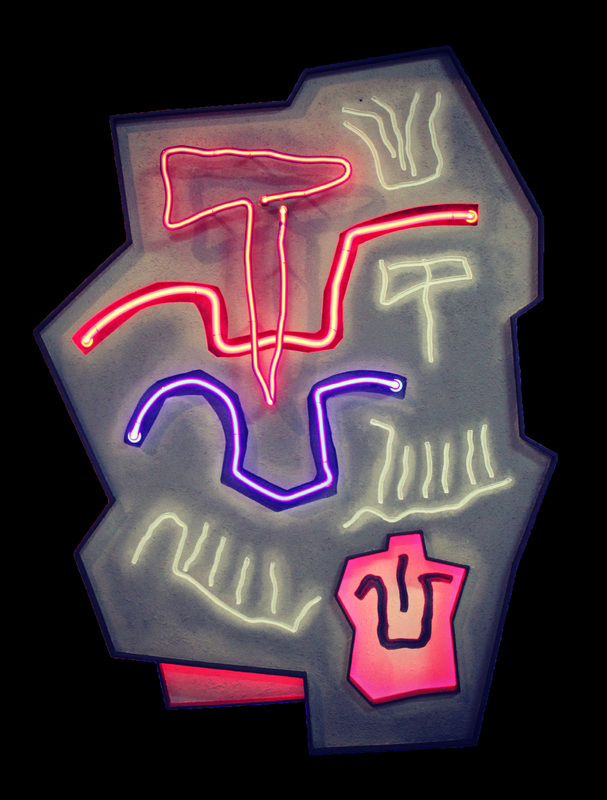 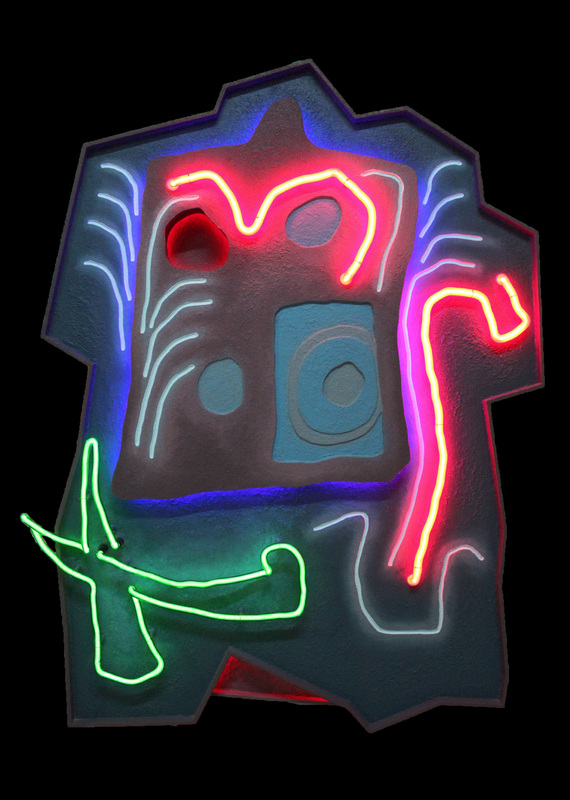 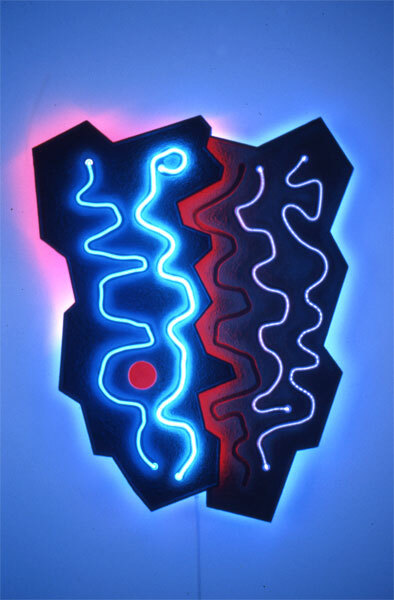 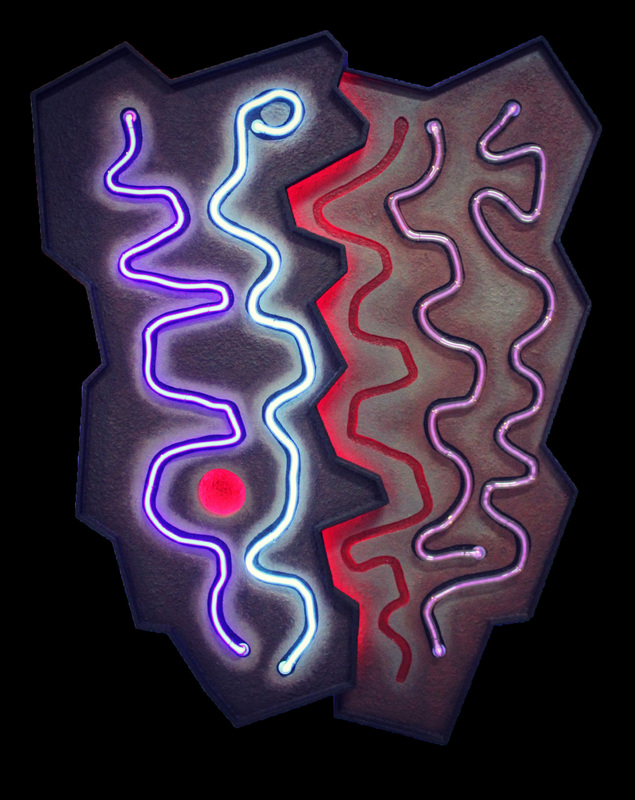 enamel on board , 30"x40"x4"
acrylic on wood with neon 18"x36"x30" approx.